Born in Vienna in 1865, Karl Theodore Francis Bitter was trained as a sculptor from an early age and worked as a sculptural apprentice in his native Austria. He emigrated to the United States in 1888 and quickly found work doing architectural decoration. Within two years, Bitter was commissioned to complete the bronze doors at Trinity Church in Manhattan, and was eventually named President of the National Sculpture Society from 1906-08. Bitter created a number of other fountains including Girl with Geese for John D. Rockefeller Jr.’s Pocantico Hills estate, Kykuit. Only two casts of Boy Stealing Geese were made. The original cast was commissioned by George W. Vanderbilt for his home in North Carolina. The photographed piece is the second and final casting of Boy Stealing Geese and was cast in 1895 and was displayed in Bitter’s home. The sculptural depiction of geese dates back to ancient times. Bitter would have had access to some of the plaster casts and was aware of the Hellenistic group of sculpture, Boy Struggling with a Goose. 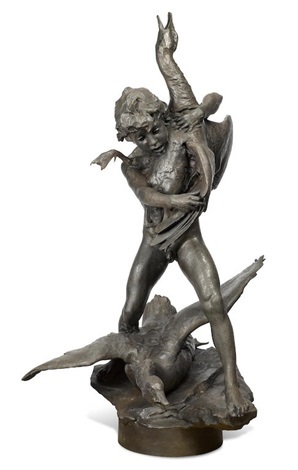 Bitter’s sculpture, however, is much more animated and dynamic, with the boy lifting the entire goose in his arms while another at his feet spreads its wings attempting to take flight. Bitter revisited the subject later with his Girl with Geese bronze sculpture, which appears much less chaotic as the girl cradles a docile goose while others rest at her feet. According to his family, Bitter’s representation of geese holds a more significant meaning. It is said that the artist owned a pet goose he had trained, named Fifi, which he used as a model and purportedly walked on a leash and accompanied him on vacation.